The garden at the Eudora Welty house, “my mother’s garden,” was a labor of love designed and created in 1925 by Chestina Welty. Today it remains a labor of love for garden restoration consultant Susan Haltom and a committed core of volunteers. These women, who have named themselves “The Cereus Weeders” in honor of Welty’s beloved night blooming cereus, have carefully restored the garden to the 1925-1945 period when Eudora Welty worked at her mother’s side planting, watering, and weeding. When visitors tour the garden today, a sense of wonder is visible again as women are on their hands and knees planting, watering, and weeding to maintain this 20th century garden as authentically as possible. The garden winds through three-quarters of an acre in the historic Belhaven neighborhood. Restored with heirloom plants, it is typical of the regional style of the day with garden “rooms” and defined areas separated by arbors and trellises. 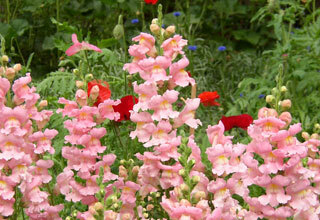 As designed by Chestina, the garden plan insured that something would be in bloom each season. Camellias and pansies abound in winter; spring brings larkspur, hollyhocks, and snapdragons followed by summer phlox, zinnias, and blue salvia, ending with fall asters, chrysanthemums, and spider lilies. 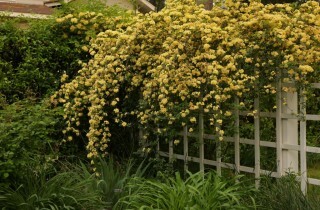 Roses, Chestina’s favorite, climb over trellises and fences in the lower garden. Surrounded by bamboo, the Woodland garden was the last to be restored. Three stalks of bamboo planted in 1925 by Mrs. Welty eventually “claimed” this area planted with flora that grew naturally in the woods of Mississippi. In the 1960s, the clubhouse fell into disrepair and was eventually torn down. Today the bamboo has been cleared and a replica of a clubhouse built by Edward and Walter Welty has been constructed from photographs of the original. The Woodland Garden is again the natural haven it was for the Welty family. 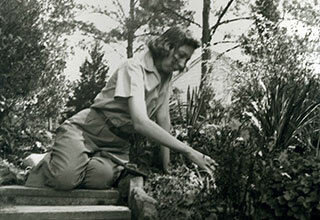 Everywhere she looked, Eudora Welty took note of details – of plants and birds, of trees and light. These details found their way into her stories, becoming emblematic and richly suggestive. 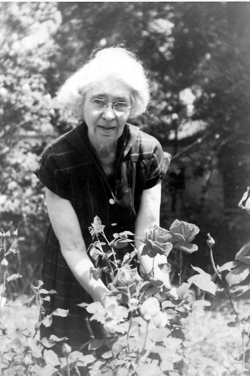 With the restoration of the garden, visitors experience the world Welty so closely observed for the 75 years she lived at 1119 Pinehurst Street. 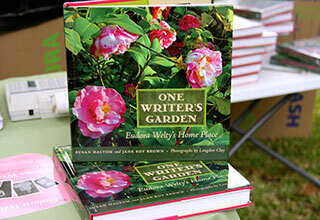 The story of the Welty garden is beautifully captured in One Writer’s Garden: Eudora Welty’s Home Place by Susan Haltom and Jane Roy Brown, with photographs by Langdon Clay (University Press of Mississippi). 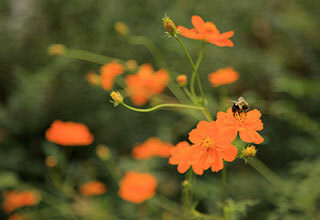 Many of the garden photographs featured here are found in this lovely book. Eudora's mother, Chestina Welty, tends the roses, her favorite, in the garden. Above, the original Lady Banks rose (Rosa banksiae var. lutea) cascades over the trellis in the restored Welty garden.